By default Qstomizer creates a new product in the shopify database each time a customer personalise a product in your store. This is the default behavior of the app but it can be changed. 1. Create a "hidden/Unpublished" collection and store these products automatically on that collection. 2. Add a line of code in certain files of your theme. All the products created by Qstomizer include the tag "hideme". You can use this tag to select these products from your store and put them in a collection. 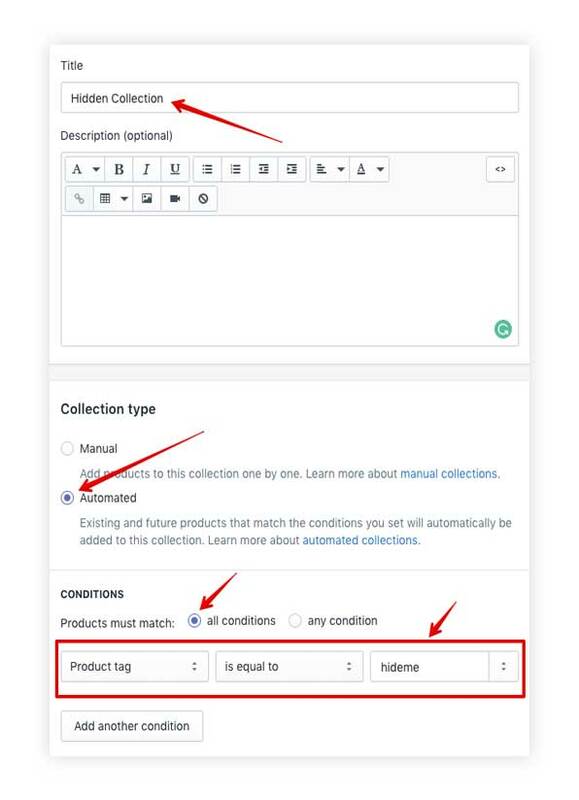 To do so, on your Shopify backend, go to Products > Collections and click on "Create Collection". 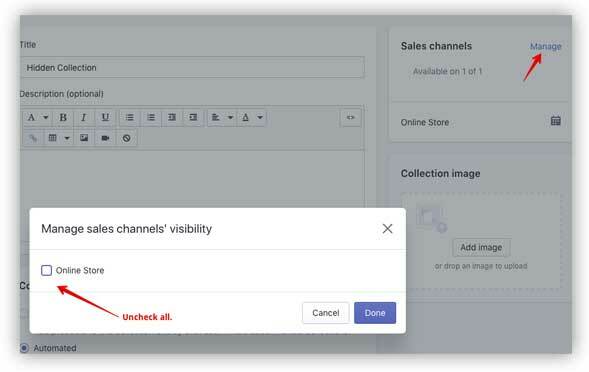 Now, in Sales Manager click on Manage and uncheck all the fields. In this way, the collection won't be visible in the store. Now, save the collection. Then, we only have to tell to Qstomizer to store the products in that collection automatically. 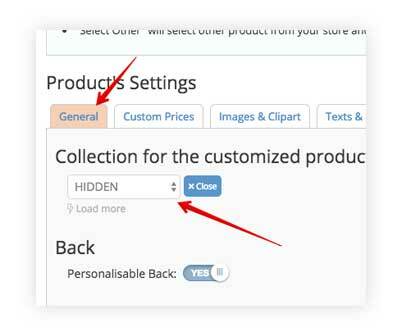 To do so, go to the product's template settings, select the tab General and in the Collection for customized products select the collecion that we have just created (HIDDEN). With these single steps, the products will be stored in that collection automatically. 2. Add a line of code in certain files of your theme (liquid files). These steps involve modifying the programming code of the theme. If you do not feel comfortable doing modification in the theme or with programming languages, contact us and we will do these modifications for you. We are going to show here how to hide the customized products from the Collection page and from the search results. This technique can be done on any other page on which you want to remove these products from. Step 1. 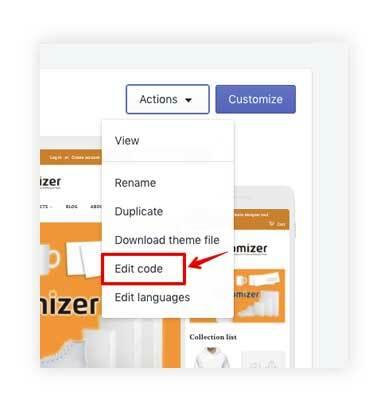 In the backend of your store, go to Online Store and select Edit Code from the Actions dropdown menu of your current theme. Step 2. in the Templates folder, open the file called collection.liquid. Step 3. If you see a line that starts with section ... put in your memory the name of the file. It is usually 'collection-template'. Step 4. Then, go to the Sections folder and open the file with the name you got in the previous step. 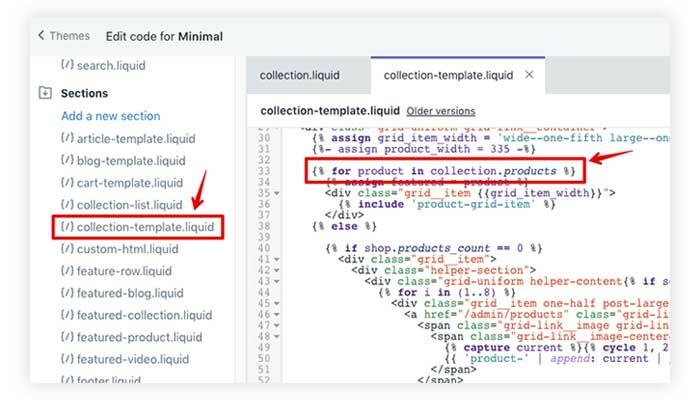 In this case, 'collection-template.liquid'. Step 5. Locate all the lines that starts with 'for product in collection.products'. Step 6. Add after that line, this one:. Step 7. Save the file. Step 1. 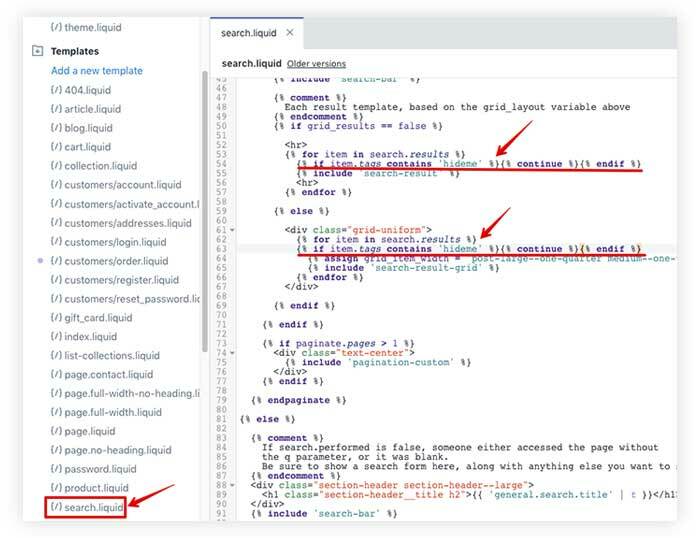 In the Templates section open the file called search.liquid.